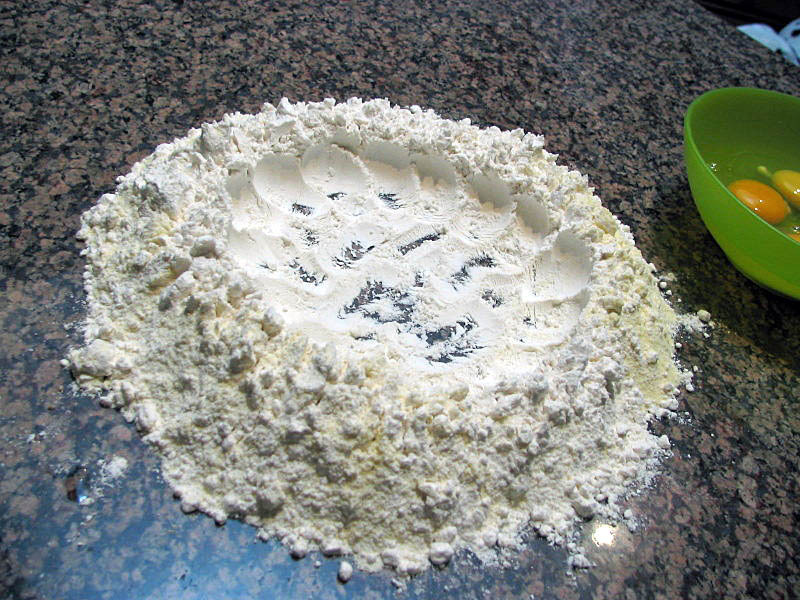 Place flour in a mound on the counter. Make a large well in the center and put the remaining ingredients in the well. 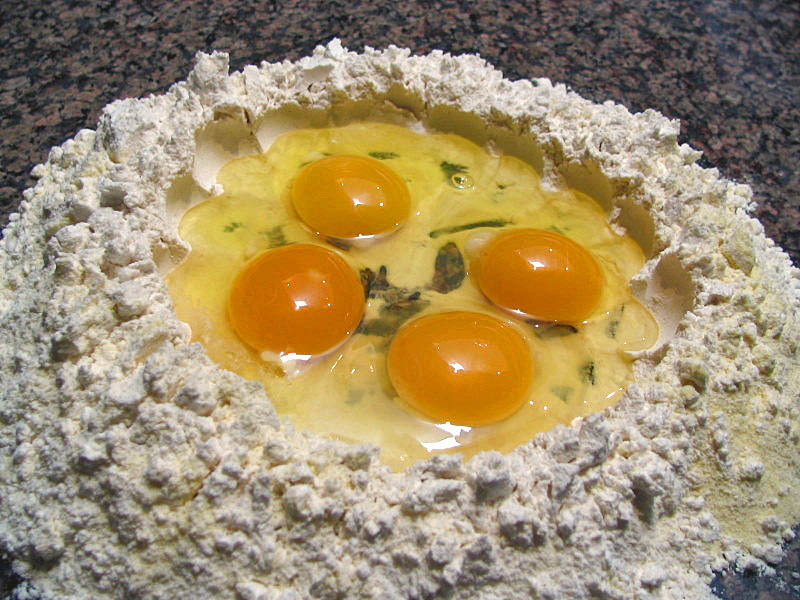 With a fork, mix the eggs, oil and salt then begin to incorporate flour from the inner rim of the well. When the dough is too thick for the fork, begin kneading and work as much of the flour into the dough as possible. Cover with a bowl or wrap in plastic to rest the dough for 30 minutes before rolling. Cut the dough in 8 pieces, and start passing each piece through the rollers of your pasta machine, starting with the largest setting. Pass each piece of the dough several times, folding it in half and passing it again through the same setting, until it feels slightly “elastic” as you stretch it. Once you reach that stage (after 6-8 passes), move to the following – thinner – setting. As the pasta becomes longer, you might want to cut it in half to make it easier to handle. Stop at the next to last setting. Lay the pasta sheets over a lightly floured counter top and form the ravioli with the filling and shape of your choice. Place the raviolis on a lightly floured cookie sheet as you form them. Gently cook them in salted, boiling water, add sauce, and serve. In a large sauté pan, over medium heat, melt 1 tablespoon of the butter. Add the shallots and sauté for 1 minute. Add the squash puree and cook until the mixture is slightly dry, about 2 to 3 minutes. Stir in the cream and continue to cook for 2 minutes. Remove from the heat and stir in 3 tablespoons cheese and nutmeg. Salt and pepper to taste. Cool completely. Lay the pasta ribbons over a lightly flour counter top, place 2 teaspoons of the filling spacing the little mounds according to the size of ravioli you want to make. Form the ravioli either as squares or triangles. Reserve, placing them on a lightly flour cookie sheet. Place a large pot with salted water to boil, and start preparing the sauce by melting the remaining 8 tablespoons of butter in a large skillet. Add the sage to the butter and continue to cook until the butter starts to brown. Remove from the heat, keep warm. Cook the ravioli in salted, boiling water until al dente (2 to 3 minutes) or until they float to the surface and turn pale in color. Remove from the water and drain well. Place some of the pasta in the center of each serving plate. Spoon the butter sauce over the pasta. Adjust seasoning with salt and pepper, sprinkle Parmiggiano-reggiano cheese over each plate and garnish with parsley. 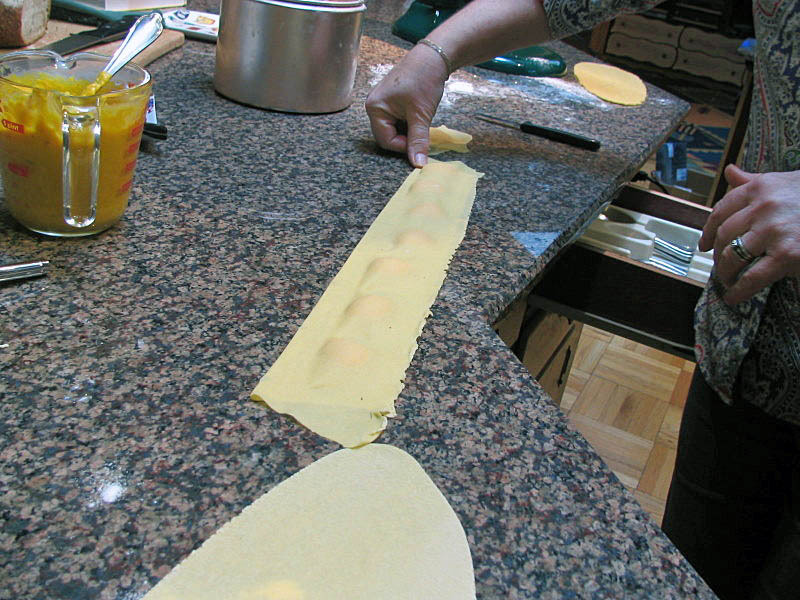 When forming the ravioli it easier to make several at once, by laying the filling over the pasta, folding it over and cutting the individual raviolo once the full extension of the pasta is filled. It is important to avoid air bubbles, so gently press the upper layer of the pasta, smoothing out the surface. I like to seal the edges with a little water, and sometimes use the tines of the fork to lock them in place, but we did not do it this time and all went well. There’s something particularly elegant about home-made pasta in general, and ravioli in particular. Keep the sauce and other dishes as simple as you feel like: your made-from-scratch pasta will lift the meal to a higher level. 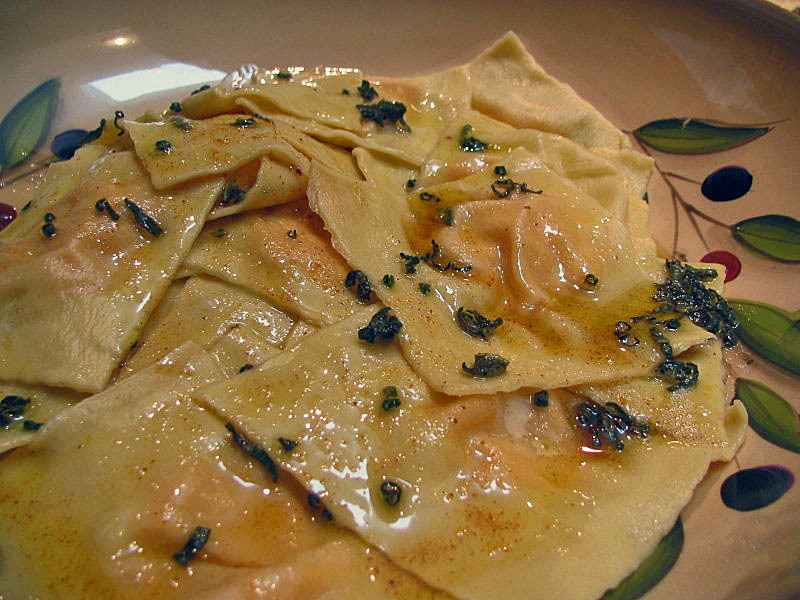 Pumpkin ravioli are one of my favourite pastas, especially with a burnt butter sage sauce! What a wonderful job you and Cindy have done, the finished dish looks fantastic! I wish I could remember where I got the original filling recipe. I would like to give credit where credit is due! Yum, this looks so tasty! And (fingers-crossed) there may be a pasta roller under the tree for me this year….I haven’t had much success with rolling it by hand. Handmade pasta is fun, even with kids. Our adult kids and their friends have such fond memories of making some. Then the low carb craze came in,,,, but we’re back at it again. Do I see some traces of semolina in the flour, that was always an addition I used? Here is a twist for your sweet tooth. Roll out a sheet of puff pastry. Dot with lemon curd (or filling of your choice – chocolate chips work). Cover with another sheet of puff pastry. Press down between the dots with a small wooden dowel. Cut down the center of the compressed areas with a pizza cutter to make “raviolis”. Deep fry at 375F till very light golden brown. Optionally, dust with powdered sugar. Similar to beignets. @Abby: my fingers are crossed for you! Hope you find exactly the pasta roller you are hoping for… I cannot imagine doing it with a rolling pin, you are brave! @Gary: let me get this straight… those beignet-like things are low in calories, low in fat, and very good for you, right? 😉 Decadent, but worth it! That looks so gorgeous and delicious looking. Happy holidays to you and your love one Sally !